Investigators examining black box recordings from the doomed Ethiopian Airlines flight have found "clear similarities" with a previous crash. Last week's crash of a Boeing 737 Max was the second disaster involving the aircraft type in five months. It comes amid continuing questions over 737 Max's design and vetting to fly. 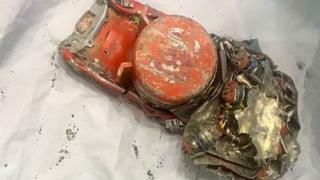 In a short statement on Monday, the Paris-based BEA, whose experts have been asked by Ethiopian Airlines to examine the black boxes, said: "During the verification process of the FDR (flight data recorder) data, clear similarities were noted by the investigation team between Ethiopian Airlines Flight 302 and Lion Air Flight 610, which will be the subject of further study during the investigation." But an investigation of the Lion Air flight showed the automatic anti-stalling system repeatedly forced the plane's nose down more than 20 times. The FAA said its "aircraft certification processes are well established and have consistently produced safe aircraft designs." "The 737-MAX certification program followed the FAA's standard certification process," it added. The world's biggest planemaker says the 737 Max is safe, but after the Lion Air crash last year it began plans to roll out a new software upgrade. Both Ethiopia's transport minister and, now, France's air accident investigation bureau, the BEA, have said there similarities between two Boeing 737 Max crashes. So where did this information come from? Well, last week, the BEA was given the job of downloading data from the plane's black boxes - the flight data recorder (FDR) and the cockpit voice recorder (CVR). This it was able to do relatively quickly. The sound files from the voice recorder - which monitors pilots' conversations and other noises within the cockpit - were sent directly to Addis Ababa, without being listened to. However, when it came to the FDR, the agency needed to make sure that the mass of data it was downloading was readable and not corrupted. It therefore brought a few basic parameters up on screen to verify them. We don't know exactly what those parameters were, but they were enough to reinforce the theory that the two aircraft suffered similar problems during flight. The Ethiopian transport ministry obviously now has all of this information - but it also has evidence gathered at the scene of the crash and satellite tracking data.